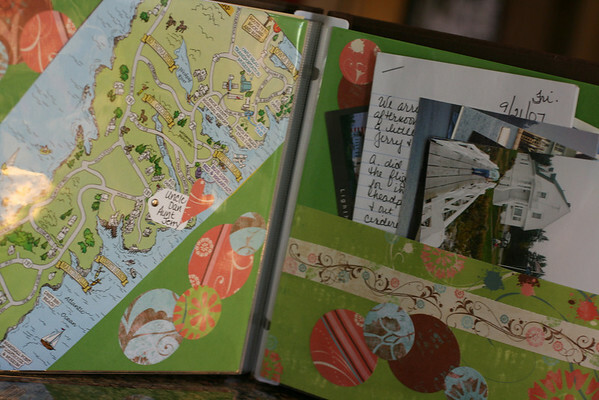 After reigniting my scrapbooking flame recently, I am pleased as punch to report that I finished the Maine vacation album. The one long overdue, you know from 2007. Ta-da! It's an 8x8 album, which is one of my favorite sizes to work with. They are perfect for one theme or event, easy for the littles to hold and enjoy and seem easier to actually finish. If you watch for sales at Hobby Lobby (or use a coupon) this size won't pinch your pocket too much either. A drawback to this size is not being able to fit very many pictures on each page. Using this size layout more and more has forced me to choose only the best pictures and to be creative with my cropping. 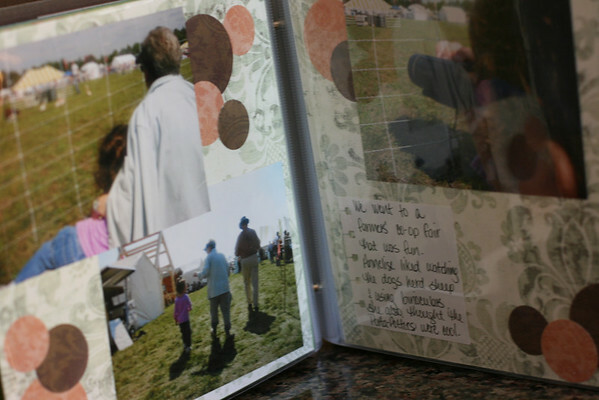 I usually crop an inch or so off each picture, use my large paper punches on my photos or only put one (maaaaybe two) uncropped photo on a page. Another thing I like to do is use a repeated pattern of simple embellishments. For this album (honestly though, I do it all the time) I used my circle punches to make circles from coordinating papers that I dotted around the pages here and there. Fast, cheap and easy! Sometimes I will type up my journaling and print it out, I do think that is a nice touch. However, I believe leaving a record of our actual handwriting is more important. Our written words, no matter if we think our handwriting is too messy, too slanted or not perfect, will be much more meaningful to our families. Remember, and say it with me, "It does NOT have to be perfect to be beautiful." For this album I either wrote on a piece of white card stock and used my spiral punch (above) to add a little flair, or I wrote directly on the layout itself (below). It's okay to do that. Really. Pinky swear. Whenever we take a trip I pack a small spiral in my bag so I can journal our experiences while they are still fresh. If you have been a faithful reader of my blog, and have plodded through my rather long winded posts, you know I have a lot to say. This little spiral has been to Maine, Washington DC (I counted a whopping 13 pages front and back for that one) and Disney World, with room left over for more memories. It helps me get my words out when I'm away and therefore helps stop my brain from exploding. Scott also appreciates the fact I write things down, not just for memories but to give him a break too. I'm nice that way. At the end of the album, along with a map of the local area on one side, I made a pocket for extra pictures, postcards, ephemera and the Maine pages (hahaha--get it, huh, get it??) from my trusty spiral. Though it took me a while to get into the groove, I'm tickled pink to be finished. Annelise was excited to look back through and talk about our trip again. 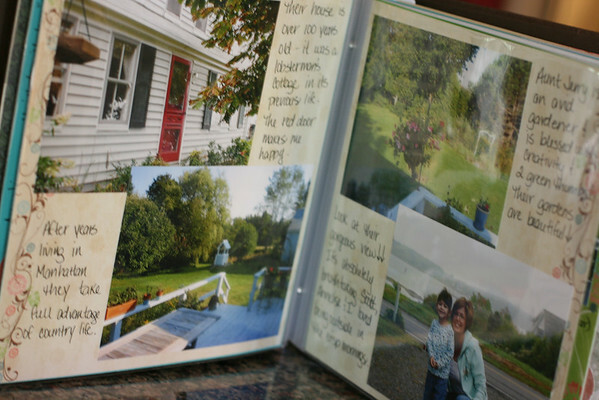 Since we don't get to visit Uncle Dan and Aunt Jerry very often, I hope this little album keeps our Maine memories fresh. Now I that I'm on a roll...watch out. Well, maybe. 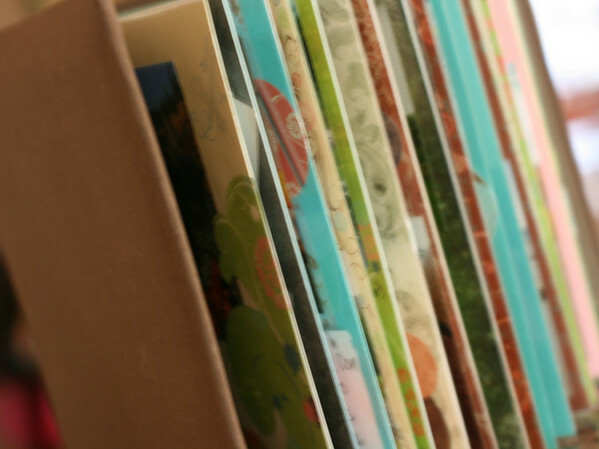 If you scrapbook, what is your favorite album size? What's your favorite tip or trick to make the process easier/faster? Do you take notes or save ephemera (yes, that's my word of the day) on your travels and use them in your albums later? Oh HOLLY! First...I am proud of you-this coming from a busy mom who knows how behind she is with scrapbooking such WONDERFL events! Second...today was the day I was to tackle my craft room once again-now I am motivated. Look good "play" good, right! Hey, I have many 8x8 books. Where do you keep them all? I haven't scrapped in way tooo long & I have boxes & boxes of the photos to prove it! I've never used the 8x8- but you can bet I will now- it does seem more managable! So impressive! What a beautiful way to preserve your memories. I admire you for taking the time to do it. I love it! What a fun project, as I remember you post on how much fun you had! I hope my goodmail got your way, I need to do a better job of recording where I send things - so hopefully you got it! Take care! Way to go! It's so satisfying to get back in the groove and get something like this done. 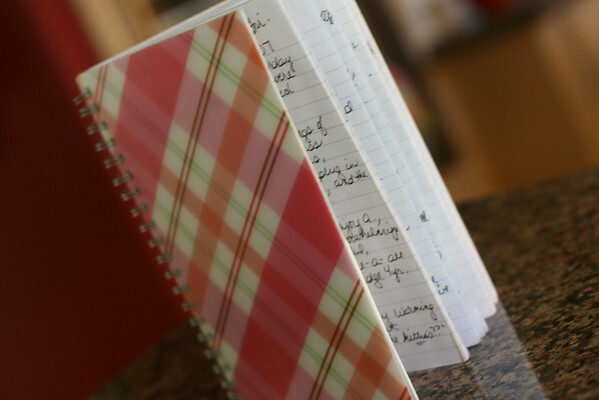 You are brilliant to journal in your notebook as you go . I always think I'm going to do that while on trips, but usually fail to be thorough enough and am sure I'll remember everything later, but never do. Ugh. Lacie: Since they are small, I usually just pile them around somewhere, maybe the coffee table or on a shelf so A. can get to them easily. Thanks ya'll! It felt good to finish an album--even a small one. You make me want to get my craft room clean out (seriously, you need shots to go in there. Or bread crumbs) and start mad scrapping. Fun times. Your books are always wonderful!! I didn't tackle the whole room (though I need to for sure), I just cleared a little work space. Good luck cleaning up your craft area.